Tonight, for the first time in my natural born life, I’m invited my parents over for dinner. This would have been fine if I wasn’t also cat-sitting, teaching two week-long tap intensives and meeting my brother’s girlfriend for happy hour as soon as I get off work (I’m really looking forward to this because she is way cooler than any of his past girlfriends have been, it just means that I’ve got to do the prep work now, before I start slinging cocktails). Also? My father’s response to my invitation didn’t exactly help matters. “Of course not,” I assured him. In truth though, “that peanut butter chicken” (which is, more accurately, a delightful peanut satay) had in fact comprised the pièce de résistance of my intended menu. I’m good at a lot of things: making pillows, decorating my walls and constructing my very own Zen meditation cushions… but cooking is not one of those things. I did pan fry a nice steak earlier this week, thanks to a Gordon Ramsey tutorial on Youtube, about half a stick of butter and the terrifying thought of getting yelled at in Hell’s Kitchen. But I’m all out of steak now. So naturally, I’ve been up since 6:00am trawling Pinterest for other options. I have a general theme in mind (quinoa and something that goes nicely with the Indian silk napkins I picked up at a sidewalk sale in Center City). Being the supportive boyfriend that he is, PIC keeps hinting that he might not actually come home tonight and that I should enjoy dinner without him if that’s the case. And being the loving girlfriend that I am, I am telling him DON’T EVEN THINK ABOUT IT. I WILL KILL YOU. So, your turn now: worst dinner party story ever? Go. I don’t really have a worst dinner party story, but I do have a recipe for chicken! It’s really simple but tasty – just get some chicken breast (I use boneless/skinless), rub some salt, pepper, basil, and marjoram on both sides. Cover in Italian dressing, cook for 30-40 minutes at 400 until the juices to run clear. Sorry I don’t have a worst dinner party either but what about making salmon fillets? Super easy, salt/pepper it then sear it for a few minutes flesh side down in a nonstick skillet coated with butter over medium high heat, transfer to the oven on a baking sheet (I always put foil on the sheet and spray with nonstick cooking spray) at 400 degrees for about 8-12 minutes (I do about 10). Worst dinner party ever would be my sister’s Thanksgiving dinner, the only time we let her make it. The turkey was burnt on the outside and raw on the inside – a result of having a birth so large that it pressed against the heating elements in the over. The biscuits were never taken out of the over and could have been used as doorstops or hockey pucks. The soup was – well, I will space you and not tell you what it really looked like or smelled like. My sister had taken three cans and put them all together – one of them was creamed corn but I can’t tell you what the others were, just one awful mess that looked like something unspeakable. My personal experience is that even when things go wrong don’t apologize. Dinner probably still tastes fine. Once my cousin commented on my lamb stew, telling me it was the best she ever tasted, and then asked me if those tiny little things were juniper berries. I should have just said yes, but I told her the truth instead – they were burned pearl onions, burned so basely that they were the size of juniper berries. But apparently they tasted just fine! Don’t you hate autocorrect? And bad typing? Birth should be bird, over should be oven, space should be spare, and basely should be badly! For suggestions – you have two great recipes here. 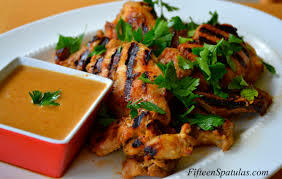 You can’t go wrong with marinated chicken, just use your favorite salad dressing and let it sit for at least an hour. Here is an easy foolproof dinner: baked salmon and string beans with cherry tomatoes. Two dishes in the over at 400 degrees for only 20 minutes if you’re using the tiny haricot vert beans. Drizzle the beans and tomatoes with olive oil, salt, and rosemary before baking. Serve with rice or quinoa if you like. Yum! The first time the BF and I hosted Thanksgiving dinner at our place, he set the oven on fire (he was trying to pre-heat it to 500 degrees, something to do with how he was cooking the turkey). Dinner actually turned out fine, but the oven fire DID set the schedule back a bit. I just thought of something… so it wasn’t a dinner party, but it was the first time I ever tried to cook a whole chicken. It had been sitting in my freezer for a bit, and even though I put it in the sink in the morning, it wasn’t fully defrosted by the time I went to cook it. I was using a recipe from my new cookbook, which called for potatoes to go in the pan with the chicken. I went to get my potatoes and realized that when you abandon them for weeks and week that they will grow stuff and then turn black and then bugs happen. It was so unbelievable gross. So we didn’t have any potatoes to go with the half frozen chicken. I ran some hot water on the inside, determined it was fine.. put the cut up lemons inside and went to put it in the oven to realize that it wasn’t hot enough. I think the chicken was finally ‘done’ by 12am or so… we went to eat it (at this point starving) and it was raw on the inside. I just threw the whole thing on the counter and went to bed. The sad thing is that the next day I had to go out and clean up this huge mess. Luckily, FH had taken care of the potato situation. The whole event left me very discouraged about cooking whole chickens. Our first Christmas eve. We invited a bug of people over and bought the turkey at the last minute because it wouldn’t fit in our apartment size fridge. At the last minute ask they had were frozen turkeys, which don’t thaw overnight. It all turned out okay and no one was poisoned.